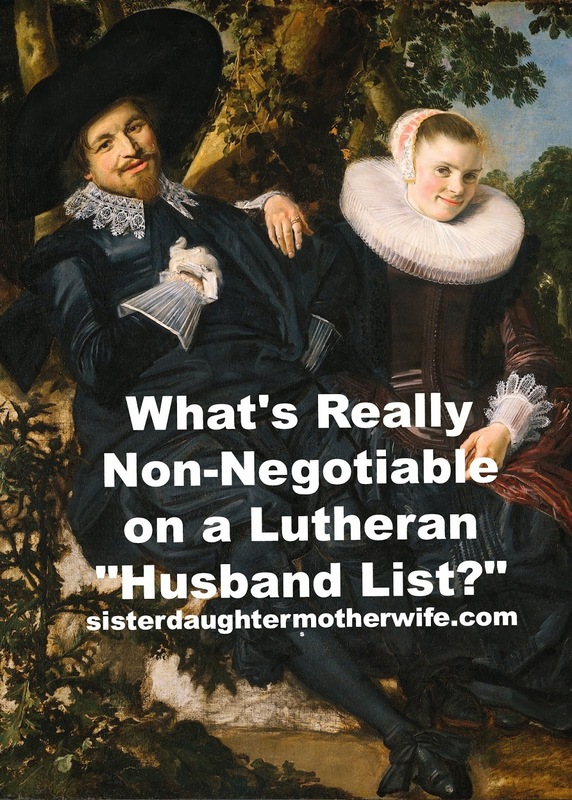 Sister, Daughter, Mother, Wife: What's Really Non-Negotiable on a Lutheran "Husband List?" Have you read, "The Husband List: 12 Non-Negotiables?” It’s an article that urges women to make a list of the qualities they want in a future husband. The author says, “The list keeps your standards in check and can help you quickly discern whether or not that guy gets a second date. It protects your heart against unnecessary wear and tear.” She provides an ambitious list of “non-negotiables” that she says are based on Scripture. Now, I appreciate the author’s intentions, but I'd like to say that this sort of thinking really concerns me. The focus is completely skewed and I believe it can be very harmful to my single friends (some of whom have shared the article on facebook). 1) God has preordained a sinless male akin to pre-fall Adam with great hair and acute insight into the female mind to sweep you off your feet. 2) God doesn’t quite know what your preferences are, so you should write a list so He can get it all right. 3) Once you know what you want and have it written down specifically He’ll send you that guy in 7-15 business days. Satisfaction guaranteed. No returns, because he’ll be flawless. Please know that I say this with great love for my fellow Christian sisters and the author of this article, as well as prayers for joy and contentment in their lives and vocations. Standards are great. This list describes wonderful traits for any man. I really hope we all get spouses with these qualities. By all means, don’t give your heart to just any fella who comes around. Good advice. But the one thing that is missing from this article is forgiveness. The woman in search of a good husband should realize that any man she marries will be a dirty rotten sinner. He might be humble, but not all the time. He might be slow to anger, but not all the time. If the man she’s interested in has frequent fits of violent rage she should stay away. Of course. If he doesn’t have any desire to protect and provide for his family, then she should drop him and run. But any man on this earth is going to be a rotten husband once in a while. He will grow, he will learn. He won’t start out as a good husband because he has probably never been a husband before. He will be bad at it! The number one, most important qualification that a woman should look for in a husband is faith in Christ’s forgiveness and the desire to forgive. That is what she should pray for. This article fails to mention that sometimes the wife will have to teach her husband. One of the “non-negotiables” on this list is that this perfect husband candidate should “Romance” you. Guess what! Some men don’t spout out poetry and can’t tell a rose from a daffodil. This is something you might have to help him with. Having to tell him what you like, or what you find romantic, doesn’t make his efforts any less valuable! Please, if you want to get married, don’t make this one of your non-negotiable qualities. Use your common sense. Surround yourself with intelligent people like your parents if you don’t trust yourself to know if he’s a loser or not. Find a man who is willing to learn and grow and love you. The only thing that matters is that he strives to love you as Christ loves the Church- the rest follows. Sure, write a list of those virtues that you want in a husband, but then work on those traits yourself. You keep yourself out of tempting situations, you seek mentors, you be slow to anger, you be humble and admit it when you’re wrong because you will fail at this impossible list. You will need that forgiveness that is first and foremost in God’s desire for you. So pray that God gives you the strength to love and forgive your future husband, just as He forgives you. The article’s author left forgiveness out of the scripture she quoted. She misinterprets the passage in Mark 10:46-52, where Jesus asks blind Bartimaeus what he wants. Jesus then heals the man and tells him "Your faith has made you well." This is similar to earlier in Mark when Jesus heals the paralytic. Jesus “sees his faith” and then forgives his sin. When Jesus asks Bartimaeus what he wants, Jesus is talking about his soul, his unclean heart full of sin. When Jesus says that Bartimaeus has been made “well,” He is saying that his sins have been forgiven, as well as his eyes. The author of this article is using this passage out of context. Jesus is talking about faith and forgiveness, this woman is talking about preferences and requests to God. He gives us eternal life and forgiveness instead. Thank God! 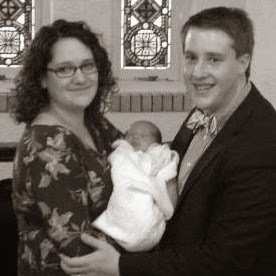 Kezia Nielsen married her husband, Aaron, at nineteen and shortly thereafter was blessed with a son. She is currently taking a break from her Deaconess and Theology studies at Concordia University Chicago to focus on her family. Kezia is a member of the Lutheran Church Missouri Synod. She is the daughter of an LCMS pastor and a stay-at-home-mom. She serves her family by keeping a comfortable home and intends to home school her children the way she and her three brothers were. Kezia enjoys singing, cooking, sewing, painting, writing, and sharing a cup of tea and a smorgasbord of ideas with friends and family. Nice post, Kez! What you say is so very true. The world would have us seek perfection in other never minding our own sinful selfishness. Thank you, Mom! That means a lot coming from you.
" Sure, write a list of those virtues that you want in a husband, but then work on those traits yourself. You keep yourself out of tempting situations,..."
This part reminds me of my own experience during a low point in my single life. When I stopped searching for Mr. Right, and re-focused on the Cross, everything seemed to fall into place. God still ignored MY plans (to go back to school for my Colloquy and not date until AFTER I'd started teaching), but went with his own, better plan. Met my future husband the 1st day at school! Thank you for your comment. God is merciful and gives so freely of His blessings. What if a guy wrote an honest top 12 non negotiable list of what he really wanted in a wife? Would it be oh so popular on Facebook? Or would it just be infamous? Are guys allowed to have even one non-negotiable expectation of a woman, even a wife? I enjoyed this post very much! And it is also nice to find another who married "young" (I married at 20)... sounds like that could be a possible topic for another post! Not that everyone should marry young, of course, but I do find it sad and difficult that our culture tends to expect marriage in the mid-twenties, at the earliest!